While chatting with my pal Maria recently I inquired why I never saw her on the golf course these days. A little gleam came into her eyes and she admitted to having a new and all consuming interest. Her allotment! ‘Follow me up on Saturday morning; I’ve to drop in to feed the hens and I’ll be up there for about a half an hour’. I didn’t need any persuading! 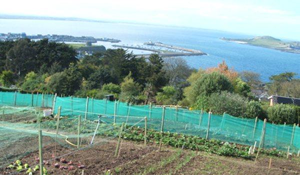 The allotments are so discreetly located high on the Hill overlooking the village of Howth that one could easily get lost! Up through the bustling Saturday village we drove, past the Church and then just on the brow of the hill, an almost invisible turn to the left brought us down a little bothareen. Living on the peninsula for twenty six years, and after many thousands of walks round the hill in a futile effort to burn off the banoffi, I thought that I must surely know every single pathway that the place had to offer. 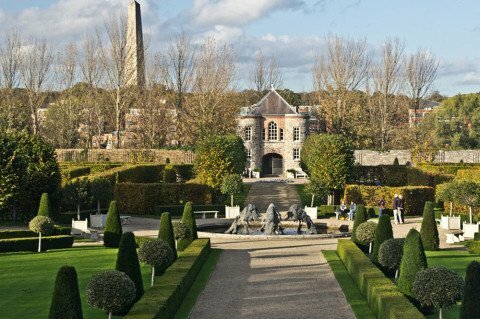 As we drove through the gates halfway down the lane, I felt like little Mary Lennox in that childhood favourite, ‘The Secret Garden! Ten o’ clock and there were already four cars parked in the gravelled area inside the entrance gates. Car boots divulged leather boots and we were ready to visit the hens. A gently sloping field houses half a dozen ‘arks’ for the hens. 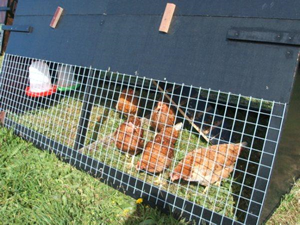 Cleverly designed, each one is 8’ x 4’, with space for the hens to pick around downstairs by day; while a little ladder which can be secured at night leads to an upstairs nesting place with lifting flaps for accessing the eggs! Very cosy! 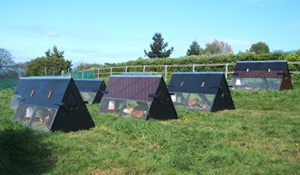 The arks can be moved around the field easily, to provide the hens with fresh scratching ground daily. Just off the hen field, Maria brought me into the shed where the feed is kept in a covered container with a section for each owner. We walked on then and through the entrance to the allotments themselves. They are laid out on the hillside to the back of the home of Lorna and David Hopkins. As we walked up to Maria’s plot we were both literally stopped in our tracks by the mind-blowing panoramic views spread out below us. Ireland’s Eye with a fleet of yachts flying their merry looking spinnakers, Lambay off in the distance. Maria’s plot, like the others, measures 100m square. A trained cook, with a keen interest in the quality of food , it occurred to her one day that her vegetables ‘were more travelled and had lived a more exotic life than she ever had’!! She also wanted to make her family aware of the seasonal aspect of vegetables and fruit, something which so many people today are so unconscious of. She now grows a really impressive selection of produce: purple sprouting broccoli, cauliflower, cabbage, kohl rabhi, garlic and onions, carrots, potatoes, parsnip, beans and peas. Ever the optimist she has now added courgettes and butternut squash to the list! At a slight remove from the allotments themselves, in the adjoining field, she grows her raspberries and strawberries. She is keen to impress though that she is new to all this and she points out that one of the great charms of the place is the great variety of people who garden the other allotments and offer plenty of informal advice over the fence! Continuing on, I met Gary who shares a plot with Meriel. He was sinking an old chimneypot, kindly donated by David Hopkins, into the soil for his mint. This is in order to stop the mint from romping over the whole place. A bag with rhubarb was waiting on the sidelines, to be carefully placed so as to avoid the autumn rotovating. The plot was picture perfect and Gary admitted to driving there straight from work each day for a complete wind-down for an hour or so. Another newcomer to vegetable growing, he seemed a little bemused at how quickly the gardening bug had bitten and was obviously getting great enjoyment from tending his plot. A gentle drizzle started to come down and we heard Meriel call ‘anybody for coffee and biscuits?’We made our way over to the shed which was very smartly laid out with open wooden lockers for each gardener. They resembled gentle old soldiers at the ready, with boots and jackets, forks and spades, ready to do battle with any weeds that dared to show their heads! As if to signal the end of our coffee break, along comes David on his quad-bike to ferry me over to the house to have a chat with Lorna. Lorna and David have been living here for well over twenty years. During that time they have bred horses and in the past whenever I visited the stable yard was always a hive of industry. Horseboxes either coming home from the R.D.S. or being loaded up with the latest hopeful. 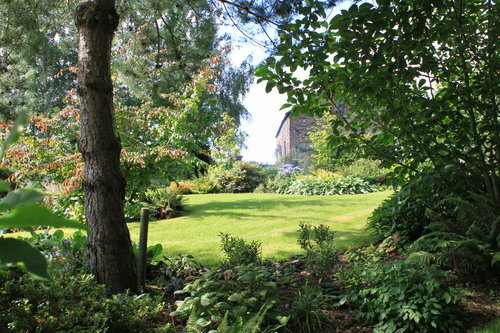 They are both keen gardeners and their garden is well stocked with many old fashioned and rare plants. However, with the family grown up and mostly moved away from home it was time to take a rest from the hard work of looking after so many animals. Through the Horticulture Society and by word of mouth through their wide circle of friends they became aware of the growing interest in the allotment movement. They decided to put the now unused fields around their house to good use. 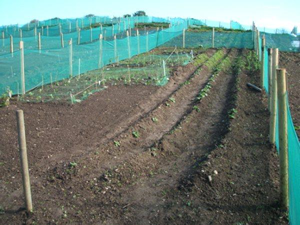 Lorna said ‘we wanted to create a community with a common interest in vegetable growing and the production of wholesome, more or less organic food.’ Like Maria, they were also keen to make people aware of the Seasons, and to bring back a bit of ‘humility’ about our food. There are at present thirty four allotments, but some of them are shared and about forty people garden there. Lorna and David are delightfully enthusiastic about the project and encouraged by the great response to it. At present they have a waiting list of close to two years for plots. A favourite local restaurant with all of us Peninsula people, ‘Aqua ‘on the West Pier have three plots which were impressively stocked and artistically laid out when I visited. They should soon be able to offer their customers vegetables grown organically a few minutes away from the restaurant. In fact you’ll probably be able to see the plot from your table! Joe and David in the ‘Country Market’ on Main Street also have a plot and will have a ‘Pot Luck Basket’ in the shop carrying excess produce from any allotment holder who has more produce than they need at harvest time. 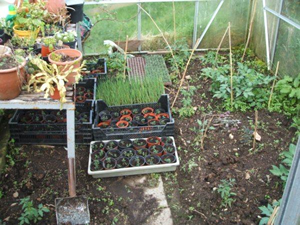 Lorna plans to hold workshops in the autumn and in the meantime continues to establish what further support gardeners require. A glance at the kitchen clock gave me a shock – two p.m.!! Maria was right –it’s like being in a time warp. Time just flies up here in the allotments. As I made my way back to the car I met Damien and Mia. They said they had come to visit the hens , but I secretly think they had come to ask Maria where was their lunch….Mia and I went over to their henhouse and we bravely tried to establish who was who….Mrs. Feathers, (eh, tricky), Eliza, Hermione, Miz Jedward, (easy, that’s the one with the quiff), Roxanne. David and Lorna’s very handsome son Ben was helping to secure another of the houses nearby, as apparently hens hate breezes. He told us that each henhouse should shortly be producing thirtyfive eggs a week, one egg per hen per day. Not every family would consume such a quantity of eggs in a week, I thought to my myself, and as if reading my mind, Ben says, but they freeze perfectly, just crack the raw eggs into a container beat with a fork and freeze till you need them. Before I got into the car I stopped to sit for a last look over the scene on the picnic bench which was kindly donated by Aonri Blaney of El Paso. As I drove down to hill to home, it occurred to me that I was the only true ‘Culshie’ among them all, yet I was blown away by the wonder of it all.